The Low-Down: Will the Rapidly Shrinking Store Save Retail? Ecommerce has changed not just shopping habits, but living habits: millennials working gig economy jobs cannot afford the big houses their longer-lving boomer parents bought. With holiday shopping in full swing, Sears decided it was time to host a “grand reopening” for its department store at Fair Oaks Mall in Northern Virginia, complete with magic shows, jugglers, face painting and free cotton candy. 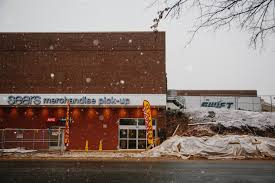 The store had done away with its entire second floor, concentrating its efforts on its appliance and mattress departments on the ground level. The apparel departments were smaller, and the store’s many cash registers had been consolidated into one sleek, white checkout counter that looked like it had been borrowed from the Apple store. It had taken more than a year to renovate the store, part of a companywide effort to square a difficult retailing circle. Sears Holdings, which hasn’t posted an annual profit since 2010, is trying to pare costs while making its stores attractive to a generation of shoppers who are increasingly buying online. “The business is evolving and we’re evolving with it,” said Matt Trautwein, the company’s district manager. Sears is not the only store cutting back on real estate. Across the country, retailers such as Walmart, Target, Macy’s and Nordstrom are experimenting with ways to distill their inventory into smaller, more-focused locations. “That big weekly stock-up where you fill up the back of the car? That’s very much boomer mentality that millennials aren’t buying into,” said Mike Paglia, director of retail insights for research firm Kantar Retail. At the Sears in Fair Oaks Mall — which is now about 78,000 square feet, down from 145,000 square feet — dozens of ellipticals and treadmills were on display, as were hundreds of appliances, many of them wrapped in festive red bows. Store managers said they tried to keep the store’s most popular departments — appliances, mattresses, lawn and garden — as large as possible, while shrinking the selection of apparel, jewelry and home goods. The company had also added computer kiosks throughout the store where customers could browse the selection at Sears.com and place orders for items that weren’t offered in a store. The retailer needs to move quickly. Sears has already cautioned there is “substantial doubt” about whether it can remain a going concern even as it pursues a turnaround plan. But longtime customers at Fair Oak Mall last week didn’t seem to know what to make of the changes. For much of the morning, employees in Santa hats outnumbered shoppers. The ones who did walk in said they’d mostly come to browse.